Today is the birthday (1324) of David II, variously called Daibhidh a Briuis in Medieval Scots Gaelic, Dauid de Brus in Norman French, and Dauid Brus in early Scots-English. He was king of Scots from 7th June 1329 until his death in 1371). This is a great opportunity for me to talk a little about Scottish history which I am still learning about in fits and starts, because I learned nothing about it in school. My knowledge of history in general had little help from my formal schooling. In Australia my high school year had zero history classes. Chemistry, physics, and maths were deemed too important. I shifted around in secondary schools in England, where the general history curriculum wandered all over the map from 16th century voyages of “discovery” (i.e. European colonialism) to naval warfare, to the Russian Revolution, to who knows where else. It settled into 19th century England for O-level, then Europe since Napoleon for A-level (plus the Roman Revolution for Latin, and a smattering of the Greek Empire for Greek). Then at Oxford it was Biblical history for the first 2 years, then the Byzantine Empire and the Protestant Reformation in my final year. Not exactly a coherent education. I thank my lucky stars, though, because by being denied an adequate training in history I also avoided the prejudices of historians as I matured. I have a bee in my bonnet about the nature of history, which, as luck would have it, I am teaching now. My first question to my students is always, “why do we study history?” Of course, they have no answer other than “we have to.” I have studied and published about various historical periods for my own reasons. I am much less interested in WHAT happened in history as WHY it happened WHEN it happened. Cynically, I’d say that MONEY and POWER are pretty well universal answers. So . . . David II. 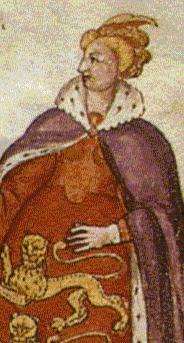 David II was the elder and only surviving son of Robert I (Robert the Bruce) of Scotland and his second wife, Elizabeth de Burgh. He was born at Dunfermline Palace, Fife and in accordance with the Treaty of Northampton’s terms, he was married on 17 July 1328 to Joan of the Tower, daughter of Edward II of England and Isabella of France, at Berwick-upon-Tweed. She was seven years old, he was only four. Their marriage lasted 34 years, but it was childless and apparently loveless. They had no children. 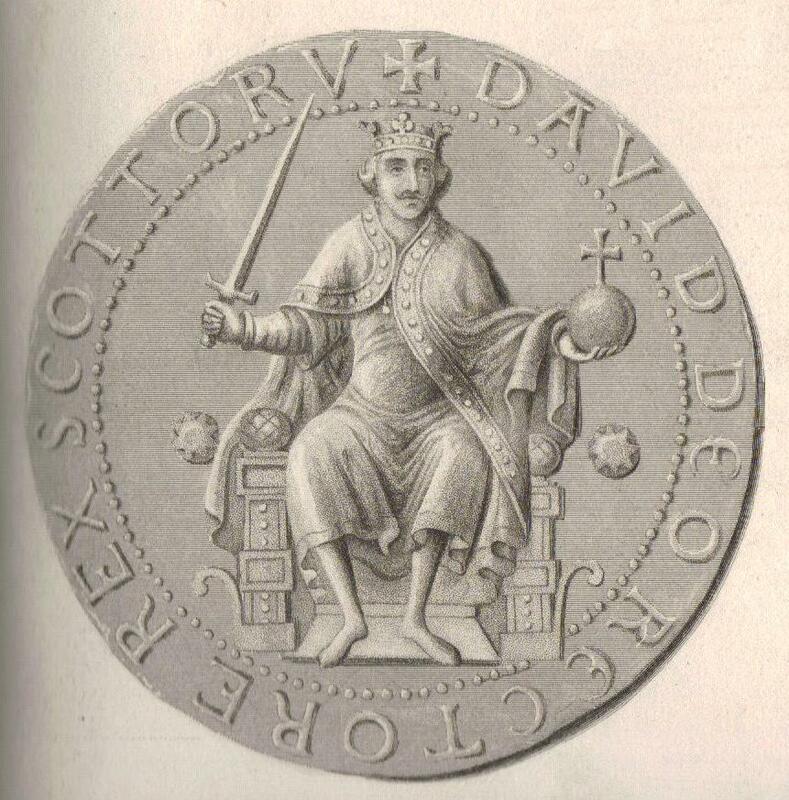 David became King of Scots upon the death of his father on 7 June 1329, aged 5 years, 3 months, and 3 days. 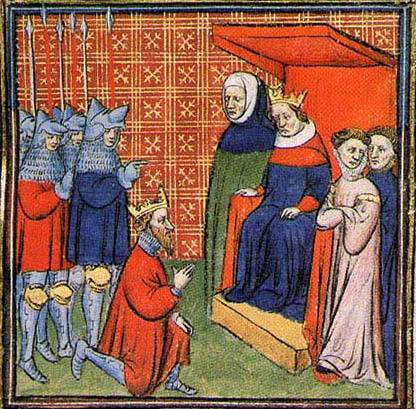 David and Joan were crowned at Scone on 24 November 1331. These were turbulent times for Scotland. Edward I (aka Hammer of the Scots) had laid claim to Scotland by birthright and so pursued a series of wars there. Resistance came from William Wallace (of Braveheart fame), whilst Robert the Bruce played both sides, eventually siding with Scotland and defeating the English in key battles. But the matter was not settled when David inherited the throne as a baby. During David’s minority, Sir Thomas Randolph, 1st Earl of Moray was appointed Guardian of Scotland by the Act of Settlement of 1318. After Moray’s death, on 20 July 1332, he was replaced by Donald, Earl of Mar, elected by an assembly of the magnates of Scotland at Perth, 2 August 1332. Only ten days later Mar died at the Battle of Dupplin Moor. 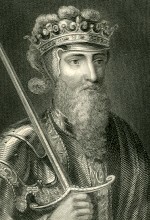 Sir Andrew Murray of Bothwell, who was married to Christina, Robert the Bruce’s sister, was chosen as the new Guardian. He was taken prisoner by the English at Roxburgh in April 1333 and was thence replaced as Guardian by Archibald Douglas (the Tyneman), who died at Halidon Hill that July. Meanwhile, on 24 September 1332, following the Scots’ defeat at Dupplin, Edward Balliol, a protégé of Edward III of England, and a pretender to the throne of Scotland, was crowned by the English and his Scots adherents. By December, however, Balliol was forced to flee to England. He returned the following year as part of an invasion force led by Edward III. Following the victory of this force at the Battle of Halidon Hill in July 1333, David and his wife were sent for safety into France, reaching Boulogne on 14 May 1334. They were received very graciously by King Philip VI. Little is known about the life of the Scottish king in France, except that Château Gaillard was given to him for a residence, and that he was present at the bloodless meeting of the English and French armies in October 1339 at Vironfosse, now known as Buironfosse, in the Arrondissement of Vervins. Meanwhile, David’s representatives had once again obtained the upper hand in Scotland, and the king was able to return to his kingdom, landing at Inverbervie in Kincardineshire on 2 June 1341, when he took the reins of government into his own hands. In 1346, under the terms of the Auld Alliance, David invaded England in the interests of the French, who were at war with the English in Normandy. After initial success at Hexham, David was wounded, and his army soundly defeated at the Battle of Neville’s Cross on 17 October 1346. David was captured and taken prisoner by Sir John Copeland, who imprisoned him in the Tower of London. David was transferred to Windsor Castle upon the return of Edward III from France. David and his household were later moved to Odiham Castle in Hampshire. His imprisonment was not reputed to be a rigorous one, although he remained in England for eleven years. Joan, being Edward’s sister, was allowed to be free and visited David only a few times. When he finally returned to Scotland she decided to remain in England, and died there in 1362, aged 41. On 3 October 1357, after several protracted negotiations with the Scots’ regency council, a treaty was signed at Berwick-upon-Tweed under which Scotland’s nobility agreed to pay 100,000 marks (to be paid at the rate of 10,000 marks per year) as a ransom for their king. This was ratified by the Scottish Parliament at Scone on 6 November 1357. David returned at once to Scotland; but, after a few years, owing to the poverty of the kingdom, it was found impossible to raise the ransom installment of 1363. 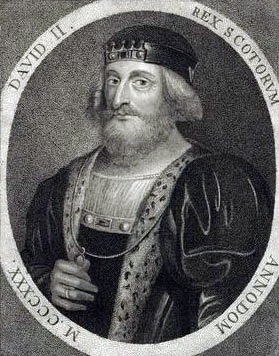 David then went to London and sought to get rid of the liability by offering to bequeath Scotland to Edward III or one of his sons in return for a cancellation of the ransom. David did this with the full awareness that the Scots would never accept such an arrangement. 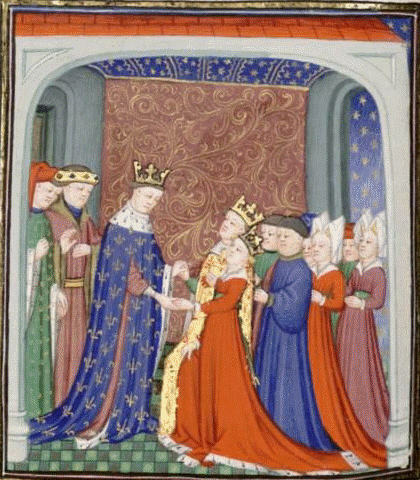 In 1364, the Scottish parliament indignantly rejected a proposal to make Lionel, Duke of Clarence, the next king; but over the next few years, David strung out secret negotiations with Edward III, which apparently appeased the matter. He remarried in 1364, Margaret Drummond, widow of Sir John Logie, and daughter of Sir Malcolm Drummond. He divorced her in 1370. They had no children. Margaret, however, travelled to Avignon and made a successful appeal to the Pope to reverse the sentence of divorce which had been pronounced against her in Scotland. She was still alive and, in theory, married to David when he died. From 1364, David was harsh with recalcitrant nobles and a wider baronial revolt, and continued to pursue the goal of final peace with England. By the time of his death, the Scottish monarchy was stronger, and the kingdom and royal finances more prosperous than might have seemed possible. David died unexpectedly and at the height of his power in Edinburgh Castle on 22 February 1371. He was buried in Holyrood Abbey. At the time of his death, he was planning to marry his mistress, Agnes Dunbar (niece of Agnes Randolph, also known as “Black Agnes of Dunbar”). He left no children and was succeeded by his distant nephew, Robert II. Thus, he was the last male of the House of Bruce. Medieval Scots cooking varied greatly between rich and poor. Oats and root crops were staples in the highlands, but the gentry ate beef, game, and fish. The cooking traditions shared a great deal with the English, but also with French influences, and were based on locally available ingredients plus spices. Here is a classic Scots soup, still popular, partan bree. “Partan” is Gaelic for crab, and “bree” for broth. Place the rice and milk in a saucepan, and simmer until the rice is cooked well. Reserve some of the best looking pieces of crab meat for garnish. 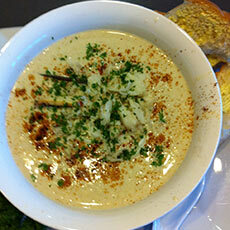 Blend the crab meat, rice, milk and anchovy fillets (if used) in a blender until very smooth. Add the blended mixture to the stock and combine well with a whisk over low heat, stirring constantly. Add cayenne (if used), nutmeg, and salt and pepper to taste. Stir in the cream and heat through gently. Serve in shallow bowls garnished with the reserved crab, paprika, and parsley.